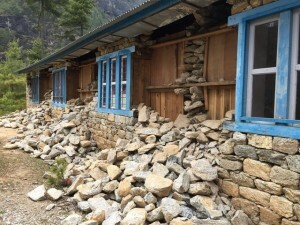 Photo of one of the schools we support in the Everest region. It has been completely destroyed and the children in the area no longer have any opportunity for education. I CAN STILL HEAR THE CHILDREN SCREAMING. We had set up a medical clinic to treat people with a variety of health problems from respiratory infections to wounds, as well as soothing the fears of more than 50 of our scholarship girls who showed up for a meal and supplies. We spent the morning talking about how bored they were because school was cancelled into the aftershocks dissipated and how they wondered if their lives would ever be the same. Although it is early for major trauma symptoms to take hold many of the children are having nightmares and many people refuse to go into their homes at all. I kept trying to reassure them that we would do all we could to help them rebuild their lives—and their homes and schools. It feels to them as if so many of their dreams are now gone. We were playing games with the children, when a HUGE earthquake hit, knocking many people to the ground, collapsing buildings, and terrorizing the children who are already so fragile from the constant turmoil beneath the earth. Kathmandu is now 3 feet higher and 10 feet further South than it was a few weeks ago. The aftershocks continue to literally rock our world. I don’t feel haunted as much by the terrible shaking as I do by the sounds of the children crying and screaming and the glazed looks in their eyes. I couldn’t sleep last night very well because the aftershocks kept rocking the bed. I slept with my clothes on and flashlight nearby in case I had to bolt quickly. 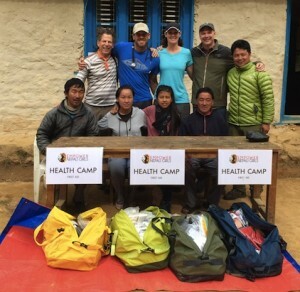 ENG Medical Team conducting a health clinic in the Everest region near the village of Monjo which was near the epicenter of the second major earthquake (7.3). We treated over 150 patients that day, most suffering from infections, injuries, wounds, and symptoms of trauma. Our team consists of Matt Parker, a special forces medic, Monet Salberg, a hospital administrator, and Hill Collins, acting as our pharmacist assistant. In addition, our Nepali staff of volunteers include Pema Sherpa (nurse), Chhusang Sherpa (translator and medical assistant), Pasang Sherpa (President of ENG in Nepal), Babita Gurung (social worker and General Secretary of ENG in Nepal), and several other social work students, nurses, and other volunteers. During our two week visit we treated 770 patients, conducted information sessions on symptoms of post-traumatic stress, visited the destroyed homes of many families, assessed damage to schools and facilities, and traveled to the hardest hit areas that had not yet received any help. This has been among the most painful, and yet the most interesting experiences of my professional life. I have known many of our scholarship girls for over 10 years, some for almost 15 years. During that time I have spent time with their families, shared tea in their homes, visited with them at school and walking on the trails, listening to the stories of their lives and the daily challenges they face. Now many of their homes are destroyed, their schools are gone, and their teachers have disappeared. My heart still hurts. I can barely sleep. I’ve probably lost 10 pounds in the last week. I can’t tighten my belt any further. I know this is the result of compassion fatigue or vicarious trauma, as well as primary trauma of surviving two major earthquakes and dozens of smaller ones. I know it is the result of working insane hours and seeing so many people compressed in a day. I know it is the result of seeing so much devastation and despair, so much sickness. I know that what we have done is just a drop in the button compared to the millions of people who still need help, need tents and food and water, need support. But after a life devoted to service, a life dedicated to teaching and helping others, I am certain that everything I have ever done, everything I have ever prepared for, was to be here now. 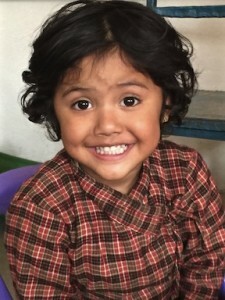 Pramisa, age 3, is our newest scholarship girl. She has not yet been told that her father died of a head injury after an earthquake.